Rahul Dravid it was a pleasure greeting you at Camp Nou! We hope you enjoyed our victory vs Atlético. Former India cricketer was at Camp Nou to watch Atletico Madrid lock horns with hosts Barcelona. 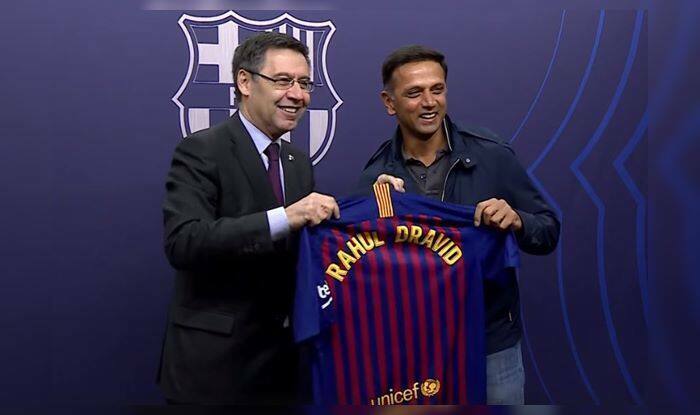 Dravid was welcomed by the Barcelona team staff, he was also honoured with a specially designed jersey o the football club. The jersey had the cricketers name printed on it and it surely would be a big honour for the legendary cricketer. “Everybody in India follows the La Liga, especially the big games, like the El Classico or a game featiring Atletico Madrid. It is wonderful to watch Lionel Messi, Luis Suarez in action.” said Dravid. Here is the video shared by the football club where Dravid is paying a visit. Meanwhile, late strikes from Messi and Suarez meant Barcelona won the match 2-0. Barcelona broke the resistance of 10-man Atletico Madrid to go 11 points clear of their La Liga title rivals. The victory leaves Barca almost out of sight with seven games left to play and maintains momentum ahead of Wednesday’s trip to Manchester United in the first leg of the Champions League quarter-finals. “It gives us a big margin,” said Suarez. United coach Ole Gunnar Solskjaer was in the crowd along with his assistant Mike Phelan but this was a familiar story of Barcelona’s deadly duo delivering when it mattered most. Costa’s early and needless dismissal left Atletico needing snookers just to avoid defeat, let alone pull off the win that their coach Diego Simeone had said last week was the only result to keep their challenge alive. “I asked the referee and he told me Costa said something to him,” Simeone said.